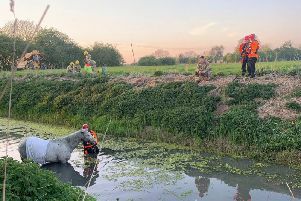 Police have recovered a man's body from the River Welland in Spalding. Officers were called at 4.29pm on Sunday, July 8, to Pecks Drove West/Clay Lake area of Spalding, to a report of a man in the river. Lincolnshire Fire and Rescue and East Midlands Ambulance service also attended. His body was recovered from the water. Sadly, he was pronounced dead. There are no suspicious circumstances to his death. It follows an incident in Peterborough last week in which a man died while swimming in a lake in the hot weather.